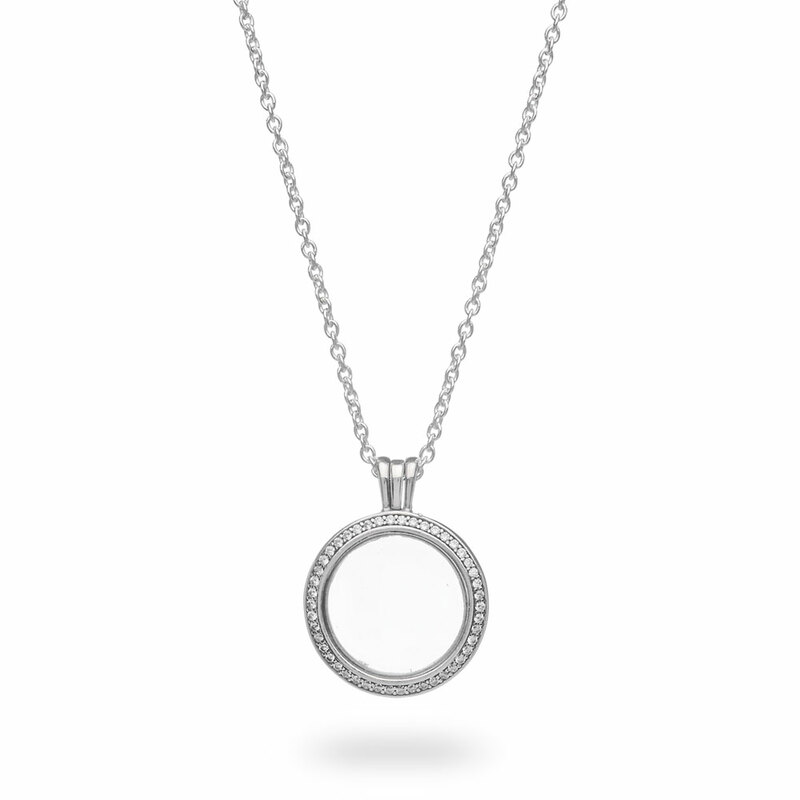 Wear your precious memories proudly around your neck with this floating locket. A decorative line of sparkling stones frames and highlights your petite, personal mementos. Select from our range of petite charms to create a style that is unique to you. This medium locket can display 3-4 petites making them appear as if they are floating in a miniature universe. Available online or in concept stores only. Sparkling PANDORA Floating Locket Necklace with Pendant is rated 4.7 out of 5 by 9. Rated 5 out of 5 by Mz Linn from Sparkling Pandora Locket, medium My son and daughter presented me with this beautiful necklace with three letters inside, MOM! I don’t want to take it off, I love it!! Rated 5 out of 5 by rowena_jean from Beautiful ! A beautiful Pandora piece, with its gorgeous sparkling cz’s on one side and Pandora logo stamp on the other it can be worn day to night, desk to dinner with or without floating petite charms (which are adorable), and worn at different lengths with it’s adjustable chain, wow, I don’t think I’ll ever take it off. Beautiful, high quality and very versatile, I highly recommend to all. Rated 4 out of 5 by Emmz8991 from Stunning but dissapointed with customer service My partner brought me this for my Birthday and I was excited to recieve it as it looked so beautiful. Unfortunately when it turned up it was dull/tarnished and the locket was slightly ajar when shut. I took it in to a local store to have it cleaned/see if I could get a replacement and was mucked around and ended up being sent to 5 different stores before one shop replaced it for a new one - no fuss. The difference was huge. The silver and the gems were much brighter, and the locket shut properly. It now looks beautiful, especially with the petite charms, absolutely love it. Only frustrated that it took so much effort to get there. Rated 5 out of 5 by Claire57 from Beautiful I bought this to put my three little grandchild charms in. It only holds about three charms, so if you’re wanting to add more, go for the larger. I loved this one because of the cz’s all around it. You can wear the other side facing, if you prefer a more casual look. Made well and beautiful, like all of my Pandora! Rated 5 out of 5 by shanxmae from VERSATILE LOOK My boyfriend surprised me with this necklace and I couldn't be more happier. It truly does give you a versatile look whether you want a shiny statement piece or have a classic pandora style locket.On one side of the pendant, it's adorned with many cubic zirconia crystals which gives it a perfect holiday look, on the other side, it has "pandora" written on the edges which is very classic and toned down. I chose the Interlocked Hearts Petite Charm in rose gold as my first little charm to go into this locket and the way the rose gold charm contrasts with the silver necklace makes so much of a difference. This necklace really is a winner in regards to it being able to give you two different looks in one product. Well worth the money. Rated 5 out of 5 by Kittee_katttt from Perfect package Will be buying all my pandora online from now on. Beautifully packaged so skimping in the gifts in boxes and delivered with no qualms. As usual beautiful products . Rated 5 out of 5 by Treesy from Beautiful Keepsake I recently purchased the floating necklace for my daughter along with the letters representing her family to put inside the pendant. She is delighted with the necklace and is able to wear a reminder of her loved ones wherever she goes.